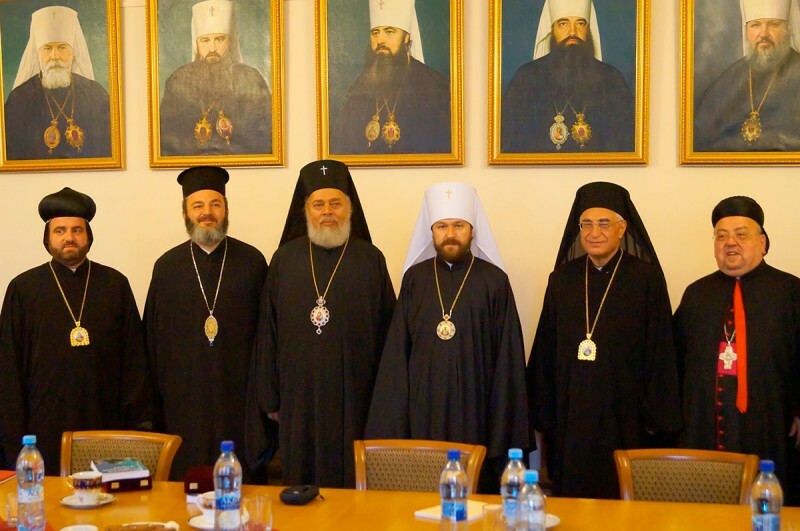 On 10 October 2013, Metropolitan Hilarion of Volokolamsk, chairman of the Moscow Patriarchate’s Department for External Church Relations, met at the DECR premises with a delegation of Christian hierarchs from Syria. Taking part in the meeting were Archbishop Nifon of Philippopolis, representative of the Patriarch of Antioch and All the East to the Patriarch of Moscow and All Russia; Bishop Isaac of Apameia, vicar of the Damascus diocese (Patriarchate of Antioch); Archbishop Joseph Absi (Melkite Greek Catholic Church); Bishop Armash Nalbandian (Armenian Apostolic Church, Catholicosate of Etchmiadzin); Archbishop Mor Silwanos Butros (Peter) al-Ni’meh (Syriac Orthodox Church); Archbishop Samir Nassar (Maronite Church); and DECR staff members, Hieromonk Stefan (Igumnov) and Rev. Mikhail Bodanov. Metropolitan Hilarion expressed his sympathy to the members of the Syrian delegation over the crisis which Syria has been suffering for three years already and over the unceasing hostilities. According to the U.N. data, over two hundred sixty thousand people have fallen victims to the war and ninety-two thousand Syrian citizens have died in these years. Metropolitan Hilarion considers it a colossal humanitarian tragedy which poses a threat to the Christian presence in the region. “We consider it our Church’s task to render you every possible assistance,” the DECR chairman said. Metropolitan Hilarion mentioned the help that Russia has been providing to the people of Syria, including the humanitarian aid collected and delivered to Syria by the Russian Orthodox Church, Ministry of Emergency Situations, and Imperial Orthodox Palestine Society. Archbishop Samir Nassar noted that three million Syrian citizens have become refugees as a result of the war; another five million people are forced to migrate from one place to another within the country. Metropolitan Hilarion expressed his hope for the peacemaking potential of the forthcoming Geneva II Conference and emphasized the importance for Christian Churches to join their efforts in order to help Syrian people. The participants in the meeting also discussed the relationships between Christians and Muslims within one and the same country. Metropolitan Hilarion reminded the guests that Russia has been suffering from the actions of radical islamists, in particular, in the Caucasus. Bishop Armash Nalbandian told all those present that the Armenian diaspora had appeared in Syria after the Armenian genocide and that some ten thousand people have fled Syria to Armenia in few recent years. “Our mission is to give hope for peaceful life back to the Syrian people,” he said. The representative of the Armenian Apostolic Church noted that the humanitarian aid delivered to Syria goes mostly to refugee camps. Bishop Isaac of Apameia told the participants that the humanitarian aid was distributed among both Christians and Muslims. “We love Russian people and thank them for their prayer, support and humanitarian aid,” Archbishop Mor Silwanos Butros (Peter) al-Ni’meh said and expressed his appreciation to His Holiness Patriarch Kirill of Moscow and All Russia and to Metropolitan Hilarion of Volokolamsk. The representative of the Syriac Orthodox Church hopes that Russia and the Russian Orthodox Church will continue to render assistance to Syria.